don't get caught: where's that kodak zi8 camcorder? It's not quite Where's Waldo or Flat Stanley--yet--but I've had a postcard of sorts from my out-for-testing camcorder. A few weeks ago, I sent out the Kodak Zi8 HD Pocket Video Camera to the first of four testers--all university communications shops--so they could compare its features and functionality to other ultralight camcorders like the Flip MinoHD Camcorder . 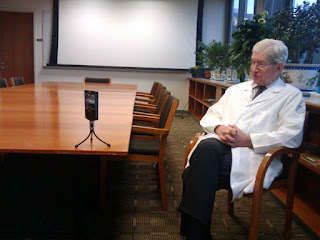 Here's a still shot of the camera in use for an interview with a faculty scientist at Rockefeller University in New York City, sent as a progress report. After a 2-week test in New York, the camera's on its way to Oregon for two weeks of testing.